Eco-Towns are popping up all over the place, Freiburg in Germany, Malmo in Sweden and next, Bordon in East Hampshire, but what does Eco really mean? Spectacle will be looking at current and proposed Eco-Towns to find out how local residents feel, what aspects make up these communities and the after effects of these large and somewhat ambitious developments. Starting close to home in the South East of England, Spectacle have visited the small town of Bordon in East Hampshire to speak to local residents about this controversial Eco-Town proposal for the area. In short, a development of 5000 houses, 15,000 new residents and some facilities bringing the town to double its size spanning a period of 20 years. 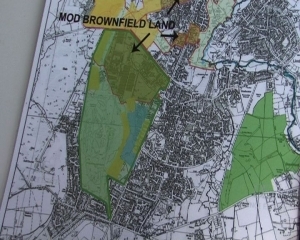 The proposals are controversial and the local people of Bordon have wasted no time in setting up Bordon Area Action Group (BAAG) to attempt to appeal this vast development. Interviews with BAAG committee members, local residents and the areas District Councillor can be found on the Spectacle project page for Eco Towns and Villages. You can see the initial Council Master-plan here or visit the BAAG website for further information on the appeal and a breakdown of the proposal. To read the latest news on Eco Towns and Villages please see the Spectacle Blog.